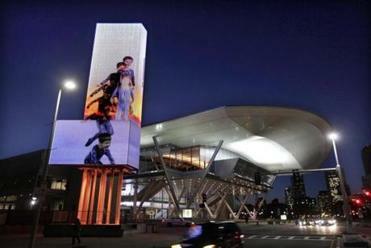 John Slepian’s “sigh’’ plays on the seven-screen marquee outside the Boston Convention & Exhibition Center. The marquee at the Boston Convention & Exhibition Center in South Boston is 80 feet tall and oddly shaped, with seven screens in all. It provides a terrific opportunity and a head-scratching challenge for video artists who want to show their work there. 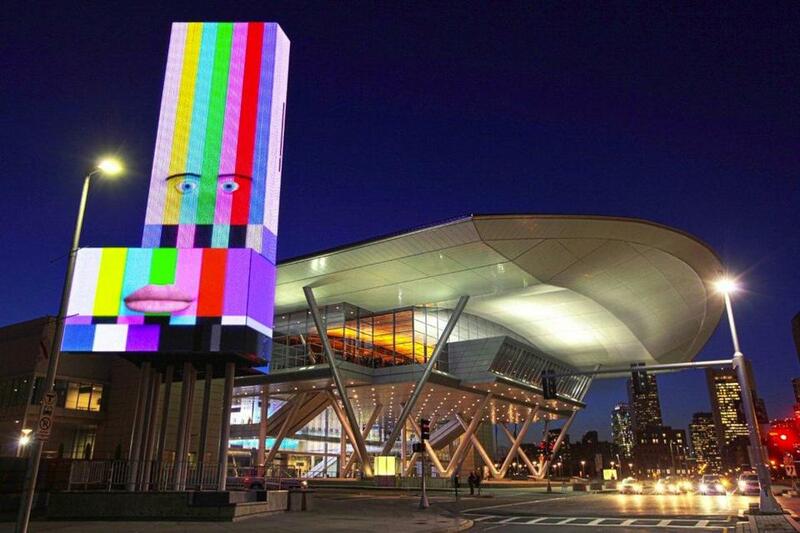 The Massachusetts Convention Center Authority invited Boston Cyberarts to program the art content on the marquee, and now video art, collectively titled “Art on the Marquee,’’ runs on a loop with ads and convention center information. Six artists are on the first rotation, and Boston Cyberarts is seeking proposals for a new slate, scheduled to premiere in mid May. (The deadline for proposals is April 2.) There’s also a plan in the works to get student-made art on the marquee. Some of the videos up now are enchanting, although they could be bolder in their use of the marquee, which requires video artists to think like sculptors. It isn’t only immense, it’s wedge-shaped, like a book standing slightly open with its spine facing Summer Street, and screens wrapping around the cover. The low-resolution LED vertical screens lead down to smaller, high-resolution horizontal screens that stick out at the bottom of our metaphorical open book. Only two of the artists make clever use of this awkward configuration. “Blue Boy Jumping’’ is one of two videos by Ellen Wetmore currently in rotation. The videos, each of which is only roughly 30 seconds long, take up about a quarter of the marquee programming, running alongside ads for television shows and pubs, and plugs for upcoming events at the convention center, such as “Audiology NOW! 2012 Conference.’’ When there’s an event, that percentage could change - the audiologists might book video time. That’s not a lot of time for the art. But strangely, it works. Showing video art on the street is a tricky proposition. Last year, the deCordova Sculpture Park and Museum curated a roster of videos at the Boston Harbor Islands Pavilion along the Rose Kennedy Greenway, some several minutes long. When I saw them, not a single pedestrian stopped to watch an entire video. “Art on the Marquee,’’ with its silent, monumental, 30-second morsels, offers just enough to capture a harried pedestrian’s attention. There’s something wonderfully transporting and stilling about them, too, amid the visual noise of the ads. The art videos come around often, because all the programming is pretty fleet. Only two run on any given day, though. On certain Sundays (March 25, April 1, April 15, and April 29) all works will screen from 8 to 9 p.m. Why not put them all in the mix every day? There are seven videos in all - Ellen Wetmore made two - and three sport-jumping or falling motifs, no doubt inspired by the 80-foot-tall screens. Of these, Jeffu Warmouth’s “Fall’’ is the most poetic. Warmouth fills the vertical screens with blue skies and puffball clouds. Men fall through the sky, unnervingly conjuring Sept. 11, although they move more slowly than they would in real life. Warmouth has made the horizontal screen below into a swimming pool, also very blue. The men end up paddling around underwater, from one side of the marquee to the next. It’s a sweet, reassuring ending. Wetmore’s dreamy “Blue Boy Jumping’’ features a little boy in pajamas, with a sunset behind him. 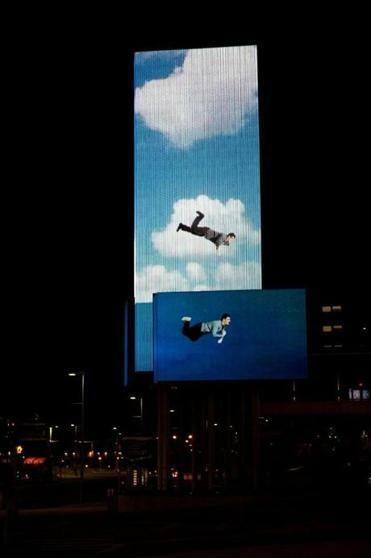 As he jumps, still images of him remain on the screen, like a parents’ effort to stop time. Wetmore uses the same technique in “Pacing,’’ shot from above as the artist paced. We look down on her, but she towers over us. The inversion doesn’t quite work. She’s just too damn big. Nell Breyer’s “Falling Men’’ looks like a game of dominoes. 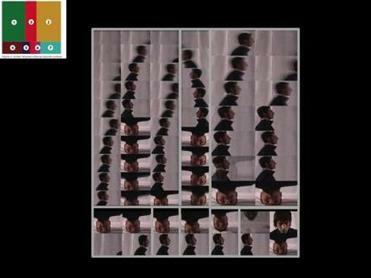 In a tight grid of small frames, men in black fall on their heads. The grid is intended to abstract the movement, so we see a cascade of black gestures down the white screen. I found myself fixating on the small images of the men, unable to take in the larger picture. Figures will do that. It’s hard to abstract them. They’re too much of a mirror for us. Then again, John Slepian’s “sigh’’ is a delightful merger of figuration and abstraction. A glaring color-bar test pattern fills the screen, complete with staticky stutters like the horizontal hold giving out on your old television set - a wonderfully effective symbol of discomfort, waiting, and distraction. Eyes appear low on the vertical screen, and a mouth on the horizontal one. The eyes close, the mouth opens a little. The figure sighs. The viewer breathes deeper, too. The only purely abstract video, Kawandeep Singh Virdee’s “Urban Bloom,’’ makes the marquee seem not clumsy at all. As light blooms from red to hot pink up the vertical screens, white and blue bubbles float over the horizontal ones. The work is a light sculpture as much as it is a video, glowing, fluttering, and three-dimensional. Finally, Dennis Miller’s “Marathon’’ spotlights runners in last year’s Boston Marathon. Still photos flash over the tall screen as digitally altered video snippets race over the smaller one. It’s closer to an ESPN clips package than a work of art, although it will no doubt appeal to tourists visiting the convention center as a Boston touchstone. This is just the first round of “Art on the Marquee,’’ and there’s much to enjoy about it. Still, here’s hoping that the longer the program goes on, the more artists will master its particular oddities, the way Virdee and Warmouth have.